In a country that cites high maternal and child mortality rates, the joyously-welcomed baby girl is celebrated as a success for Abundant Health, the global health initiative of The United Methodist Church. The initiative, led by GBGM’s Global Health unit, has a goal of improving mind, body and spirit health and wholeness for all people through church and community engagement. Specifically addressing health and wellness for children, such as Ngombe’s newborn, is one part of the initiative and is tied to a partnership with the United Nations’ Every Woman, Every Child program, which has a global goal to reach 15 million children by 2020 with life-saving interventions. The United Methodist Church, through GBGM’s Global Health unit, has committed to helping with that goal by providing life-saving interventions for 1 million children. As of June, Abundant Health has reached 376,122 children, according to Dr. Simbo Ige, executive director of Global Health for the General Board of Global Ministries (GBGM) of The United Methodist Church, a number that is on track to reach the 1 million goal by 2020. And Ngombe’s baby is counted in that number. 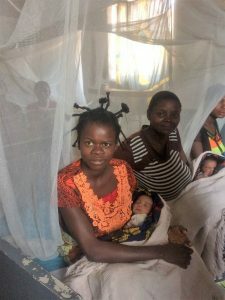 The infant was born to the young Congolese woman and her husband after Ngombe experienced three stillbirths during home deliveries. Sadly, the loss that Ngombe experienced is common. In the Democratic Republic of Congo, many women fail to get prenatal care, delay going to the clinic at the beginning of labor, if at all, and ignore personal health care. 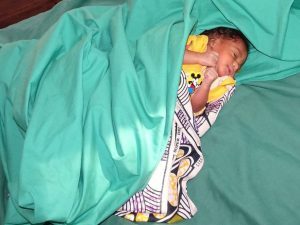 Ngombe’s first live birth occurred at the Dingele Methodist Health Center in Central Congo, where Ngombe received prenatal care in the months prior to her health clinic delivery. Serving 8,400 people in 13 villages, the Dingele Methodist Health Center, with funding from Abundant Health, has been renovated, equipped and staffed with trained healthcare workers and community health workers (CHW). It was a CHW who visited Ngombe in her home and encouraged the young woman to visit Dingele. The CHW then accompanied her for appointments and, later, arranged for Ngombe’s travel for the delivery. Addressing global health challenges, such as infant mortality, is part of The United Methodist Church’s four areas of ministry focus. In addition to global health, the denomination is committed to engaging in ministry with the poor, developing principled Christian leaders and creating new and renewed congregations. The Bible verse from the Gospel of John, chapter 10, verse 10, which says “I came that they may have life and have it abundantly.” (New Revised Standard Version), serves as a directive for Abundant Health goals, Ige says. “Wherever we are working with children, we are counting them,” she says, explaining that the objectives are the same for each project, but can be adapted to the context, such as prenatal care, anti-malarial and HIV medicines, mosquito nets and clean water. For Ngombe, the “intervention” involved being encouraged by a local health representative to visit the nearest health facility late in her pregnancy, a step the young woman had not taken with her previous three pregnancies. Though her husband discouraged her from seeing a doctor, Ngombe, accompanied by the CHW, went to the clinic. When time came to deliver, Ngombe gave birth at the health clinic and left, this time, with a healthy baby. Ngombe’s story takes place on the continent of Africa, but life-saving interventions are happening throughout the world. To provide nutrition education, many children participated in nutrition classes at by St. Luke United Methodist Church in Augusta, Georgia. In Little Rock, Arkansas, United Methodist churches, through Interfaith Arkansas, have partnered with Arkansas’ No Kid Hungry campaign, to become summer feeding sites that offer breakfast and lunch to ensure low-income children continue to receive nutritious meals when school is not in session, Rodgers said. “We have churches in the U.S. opening their doors and turning their basements into gyms, organizing VBS with exercises and many others who are sharing their stories with us,” Ige says. “We want to tell the world that The United Methodist Church is committed to health and so that the world sees that we care about the whole person. *Crystal Caviness is a senior public relations specialist at United Methodist Communications in Nashville, Tennessee. She can be reached at ccaviness@umcom.org or 615.742.5138.